Pediatric DKA was identified as one of key diagnoses that we need to get better at managing in a massive national needs assessment conducted by the fine folks at TREKK – Translating Emergency Knowledge for Kids – one of EM Cases’ partners who’s mission is to improve the care of children in non-pediatric emergency departments across the country. You might be wondering – why was DKA singled out in this needs assessment? It turns out that kids who present to the ED in DKA without a known history of diabetes, can sometimes be tricky to diagnose, as they often present with vague symptoms. When a child does have a known history of diabetes, and the diagnosis of DKA is obvious, the challenge turns to managing severe, life-threatening DKA, so that we avoid the many potential complications of the DKA itself as well as the complications of treatment – cerebral edema being the big bad one. The approach to these patients has evolved over the years, even since I started practicing, from bolusing insulin and super aggressive fluid resuscitation to more gentle fluid management and delayed insulin drips, as examples. 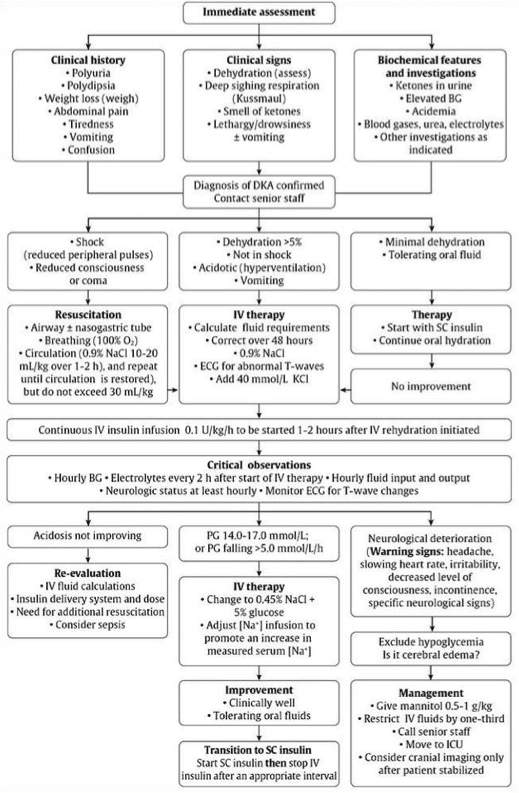 There are subtleties and controversies in the management of DKA when it comes to fluid management, correcting serum potassium and acidosis, preventing cerebral edema, as well as airway management for the really sick kids. In this episode we‘ll be asking our guest pediatric emergency medicine experts Dr. Sarah Reid, who you may remember from her powerhouse performance on our recent episodes on pediatric fever and sepsis, and Dr. Sarah Curtis, not only a pediatric emergency physician, but a prominent pediatric emergency researcher in Canada, about the key historical and examination pearls to help pick up this sometimes elusive diagnosis, what the value of serum ketones are in the diagnosis of DKA, how to assess the severity of DKA to guide management, how to avoid the dreaded cerebral edema that all too often complicates DKA, how to best adjust fluids and insulin during treatment, which kids can go home, which kids can go to the floor and which kids need to be transferred to a Pediatric ICU. Why can Pediatric DKA be easy to miss? Specific high risk groups (ie. Teenagers, children on insulin pumps and those from lower socio-economic status). Remember that glucose should be considered the sixth vital sign and any “sick” appearing child should have a point of care glucose done! Once DKA is suspected, elements on history should focus on screening for symptoms of diabetes (polyuria, polydipsia, enuresis ,weight loss) as well as symptoms of DKA (nausea, vomiting, abdominal pain, decreased alertness). However, be sure to take the assessment one step further and consider any precipitating causes (viral or bacterial illness, social factors etc). DKA is most commonly seen in patients with type 1 diabetes since the disease is defined by insulin deficiency. The lack of insulin prevents glucose from being used as an energy source. As a result, free-fatty acids are used as the primary energy source. 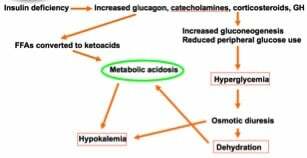 Consumption of free-fatty acids leads the formation of keto-acids and precipitates a metabolic acidosis. The acidosis shifts potassium into cells leading to a relative hypokalemia. (see correction below) The lack of insulin also results in a surge of stress hormones. An increase in stress hormones causes increased production of glucose. The fact that the body is not consuming glucose and continuing to produce it leads to a further increase in serum levels. Rising glucose levels precipitate an osmotic diuresis leading to dehydration. The diagnosis can be made from either a VBG or ABG. Since a VBG is readily available, fairly accurate in the setting of DKA and not as painful to attain, our experts recommend VBGs over ABGs in this setting. The severity of DKA ranges from mild to severe and will influence the treatment and disposition of the patient. The classification is made based on two laboratory values: pH and HCO3. Note that serum ketones are not required for the diagnosis of DKA and are not routinely ordered by our experts. There are a number of important differences between the management of DKA in pediatrics compared to adult patients. While adults require large volumes of intravenous fluids, large volumes of fluid are harmful in pediatric DKA. The administration of IV fluids should be done very judiciously in the pediatric population. The second important difference is the administration of insulin. While insulin is bloused in the adult patient, insulin boluses are contraindicated in the pediatric patient with DKA. Monitoring and correction of potassium is heavily stressed in the adult patient with DKA. In children however, IV fluids are started prior to insulin administration, and a potassium level will always be available prior to initiating insulin. With respect to the acidosis, bicarbonate is indicated in adult patients who are profoundly acidotic. In contrast, sodium bicarbonate is not indicated in children outside of an arrest situation. NOTE: All cases of DKA should be managed in consultation with a pediatric diabetes specialist if possible. These patients are often stable and can usually be managed with subcutaneous insulin in the ED. If they are able to tolerate oral fluids they can often be treated as outpatients with close follow-up in diabetes clinic the next day. Children under 5 years of age will generally be admitted as they are higher risk. IV fluids: The fluid of choice in these children is normal saline. Knowing that fluid boluses can be harmful in children with DKA, your first step should be to calculate their volume deficit. The goal will be to replace their deficit and ongoing maintenance over 48 hours. MDs overestimate dehydration in 2/3 of children with DKA. As a general rule, children in moderate DKA are usually 4-8% dehydrated. Our experts suggest that 2x maintenance should be the upper limit of your infusion rate to prevent overcorrection of osmolality. Fluid blouses should only be given if the child is in decompensated shock (hypotensive). Even then, bolus judiciously with 5-10cc/kg and reassess frequently. Insulin: NO INSULIN BOLUS. Administration should always be done after 1-2 hours of intravenous fluids. Target 0.05-0.1U/kg/hr infusion. Potassium: In contrast to adults it is permissible to start insulin before having a potassium level back on your patient. If the initial potassium <5.5mmol/L and the patient has urinated, add 40kcl to IV NS infusion. Before contemplating a bolus of IV fluids, be sure to evaluate what the lowest allowable systolic blood pressure is in your patient. These patients are at the greatest risk for presenting with, or developing cerebral edema. There is very little evidence to suggest whether mannitol or hypertonic saline should be first line treatments for cerebral edema in children with DKA. Treatments will depend on local practice patterns and what is available in your department. If the child has become altered, give whatever you have available to PREVENT cerebral edema. It is helpful to know who is at greatest risk of developing cerebral edema so we can be proactive in monitoring and screen for warning signs. There are a number of patient and treatment-related risk factors for cerebral edema. Note that these are associations only. If intubation is required, know that this will be a risky procedure and may worsen the patient’s clinical outcome. BEFORE you intubate your patient make sure you have a PRE-INTUBATION pC02 level. You will want to keep their pC02 around this mark post-intubation. Both over-ventilating and under-ventilating them will dramatically affect the speed at which their acidemia corrects. This should be done in consultation and with guidance from a pediatric intensivist when time permits. Sodium Bicarbonate is generally not indicated in the management of acidosis associated with DKA. The only mention of sodium biarbonate in the new Canadian Diabetes Association (CDA) guidelines is that it may be considered in the arresting patient. Target to glucose between 10-15mmol/L. Add dextrose as necessary but maintain insulin at the same level since this is what will correct the persistent acidosis. Which patients with Pediatric DKA can be discharged home? In order to meet the criteria for safe discharge, patients must have presented in mild DKA, be older than 5 years of age, tolerate oral fluids and be otherwise well with good home supports. The TREKK criteria for safe discharge home include: resolution of acidosis following treatment of mild DKA with subcutaneous insulin and monitoring.